Treetop Sisters: Jade Turns 10! Jade had her 10th birthday last month. I cannot believe that she is now in double digits. Especially, when I start to look back at all the photos of the girls singing and dancing from years past. But yes she is officially growing up and we as parents will just have to deal with it. The girls have very individual styles of music that they like to listen to and so I can only imagine that this is going to make for an interesting collaboration if they ever want to get into songwriting. Back to the birthday girl…. She wanted to go to “High Rise” with is a trampoline place with one of her friends from school and her sisters and have an emoji cake. 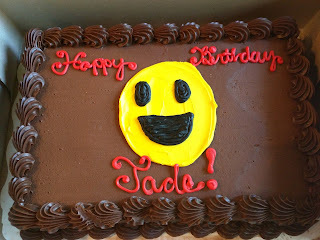 Love the child that does not have a detailed and lengthy birthday celebration planned. Cake and Fun, I don’t think you can do any better than that. 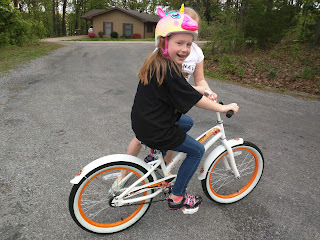 I loved the bike helmet that I picked out for her, something that she had been eyeing for a long time. I love that Jade doesn’t go for what is “cool” but for what is fun! Cannot wait until next year and see what we will be doing for her birthday. Balloon ride, horseback riding trips up the Amazon, who knows… stay tuned.